Aguachile is an ancient cooking method, probably invented in the Mexican state of Sinaloa and quickly spread into Northern Mexico. Initially, the Aguachile technique was used to soften and season the jerky meat: the meat had been submerged into a bowl filled with boiling water along with Pequin or Chiltepines chili peppers. Starting from this process, the Aguachile recipe evolved into a tasty marinade, and used to flavor raw fish and seafood, particularly shrimp. Nowadays the Aguachile marinade is composed of lime juice, salt, and vegetables: commonly chili peppers, cucumber, and red onions. Besides, the essential ingredient the Aguachile is subject to several variations with different vegetables and proteins. 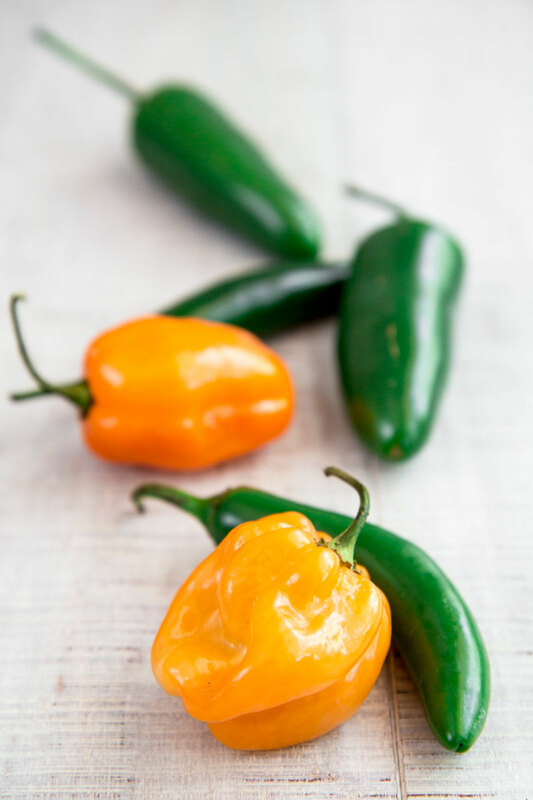 The most used chili peppers are Jalapenos, Serrano, and Habanero, mixed depending on the personal taste. Some Aguachile recipes also require fruit like mango or watermelon; in some others Mexcal or Tequila are added to the marinade. A particular version is Aguachile Rojo (Red Aguachile) made with red chili peppers and sometimes tomatoes and Habanero red sauce or Huichol salsa, a hot sauce typical of the Nayar mountains. 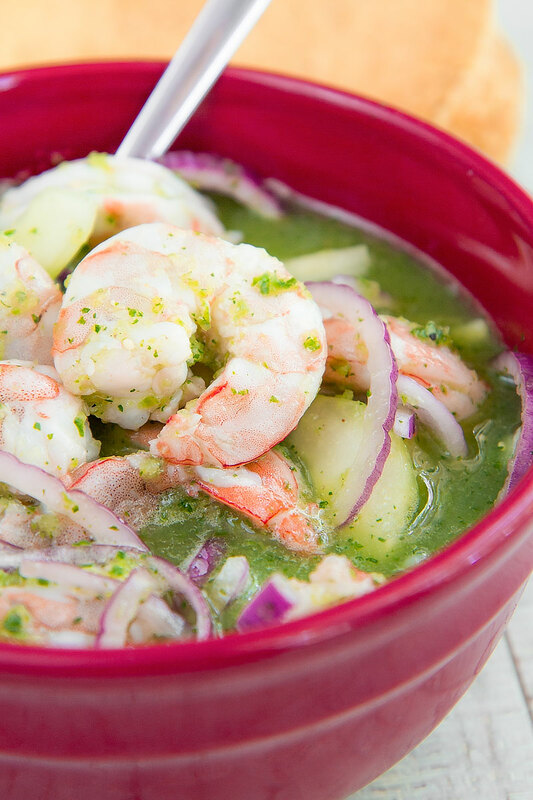 As I said, the most famous Aguachile is with shrimp, but this recipe is also prepared with other seafood and fish, like tuna, snapper, clams, or octopus. The octopus Aguachile is the only one where the seafood is previously boiled before being marinated. SHRIMP – Choose and handle the shrimp is critical to prevent possible foodborne illness. You want to prefer prime quality seafood, previously frozen, and prepare the Aguachile as soon as possible. The best way is buy the shrimp frozen and thaw out them directly in the fridge. Once the shrimp are thawed, prepare the Aguachile at least within 12 hours. If you don’t feel comfortable eating raw seafood, boil the shrimp before marinating: it is not strictly traditional, but tasty as well! CHILI PEPPERS – Personally I use a blend of Serrano, Jalapenos, and Habanero peppers. Feel free to experiment your preferred amounts and varieties to find your preferred grade of spiciness! 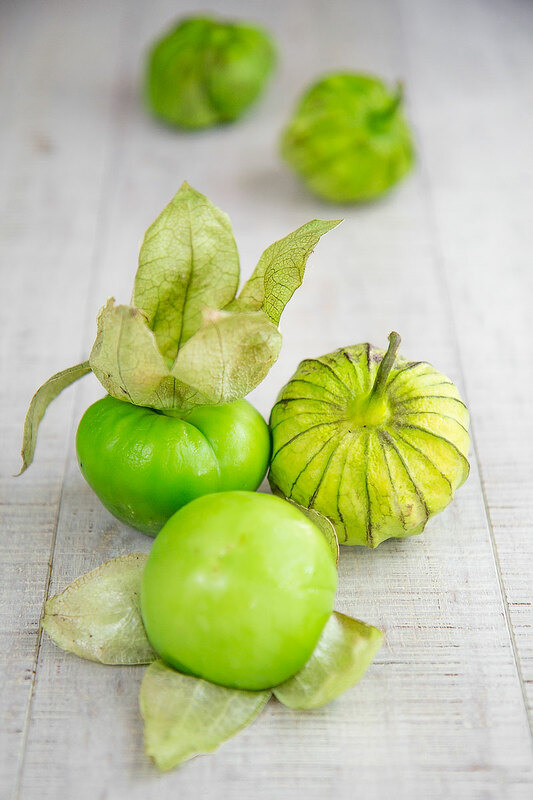 TOMATILLOS AND OTHER VEGETABLES – Beside the classic vegetables, I like to add a tomatillo into the blender. Some chefs love to add fruit like mango in pieces just before serving. 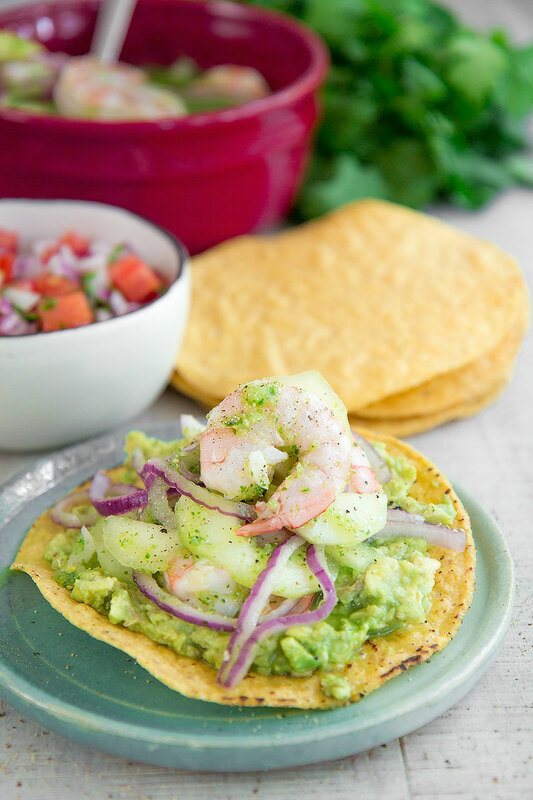 Given that the Aguachile recipe requires raw shrimp, you want to choose prime quality frozen seafood. 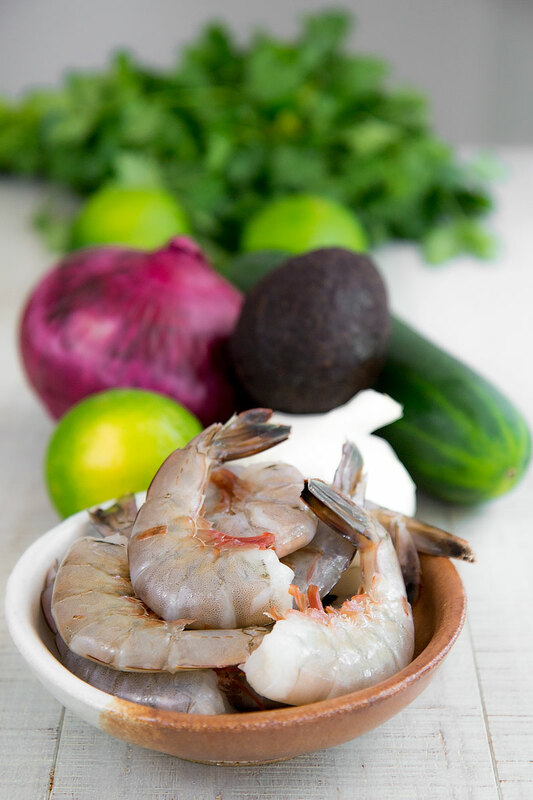 To thaw out correctly the shrimp, place them in the fridge the previous night and prepare the Aguachile as soon as possible or at least within 12 hours the seafood is thawed. Rinse the shrimp, then peel them. If you want to utilize the peels, prepare a broth following my recipe. Now, incise the back and the underside of each shrimp and discard the black veins: this step is critical otherwise the taste of the recipe will be ruined. Finally, rinse the seafood one more time, place them into a bowl and toss with 1 tsp of salt. Now, season with 1 cup of fresh lime juice, wrap the container and store into the fridge 2 hours. After 2 hours, take the bowl out the fridge, and raise the shrimp saving the liquid. Now, cut the peppers in half and discard the seeds and any white part. Then, peel and chop 2 tomatillos into quarters. Finally, peel and slice half of the cucumber. At this point, mix all these ingredients with a blender along with a peeled clove of garlic and the liquid of the shrimp, until smooth. Eventually, pour the Aguachile marinade into the bowl along with the shrimp, wrap, and store in the fridge 1 or 2 hours more, until the seafood looks white and firm like it was boiled. At this point, slice the half onion and the half of cucumber finely. 30 minutes before serving, add the sliced vegetables into the bowl and salt to taste. 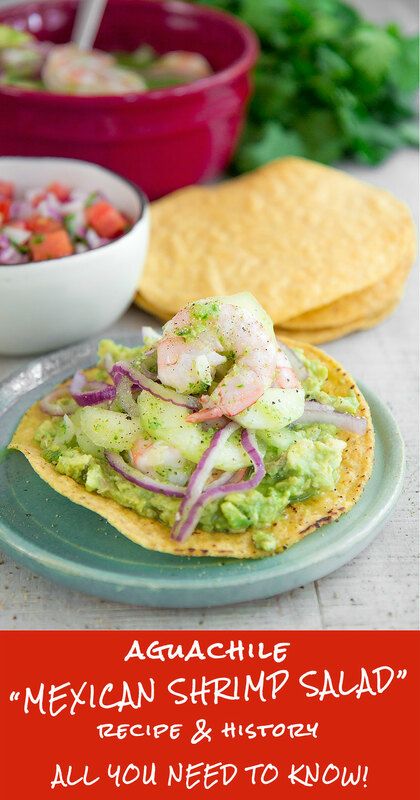 The Aguachile is traditionally served into a bowl: every guest serves himself pouring a couple spoons of shrimp and marinade on a tostada. 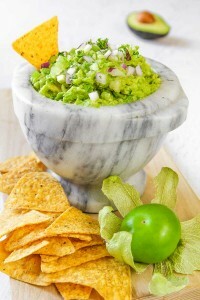 A tasty way to serve Aguachile is along with avocado. 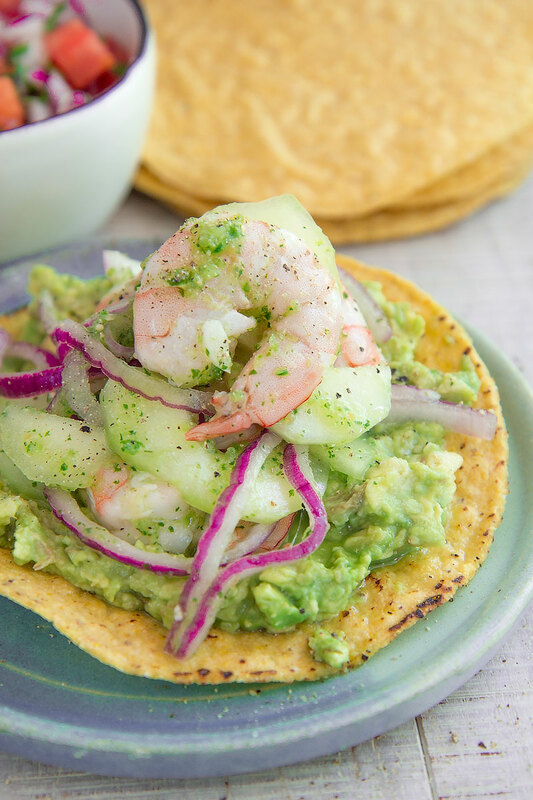 Mash the avocado pulp along with a splash of lime juice then spread it over the tostada. Finally, add some shrimp and vegetables, garnish with a spoon of Aguachile marinade and a sprinkle of black pepper, then serve immediately! « SFINCIONE: SICILIAN PIZZA RECIPE & HISTORY – all you need to know! Haven’t made it yet but sounds sooo good! Will try this saturday. Thank you for the recipe!